Rainbow Has a Long Term Solution to Mice! Have you ever noticed that mice come back year after year, often in the same part of your house? The industry standard for dealing with mice is to bait and trap. While this can eliminate the current population of mice, it only provides a short term solution. Unlike our competitors, we work to eliminate the current population and prevent them from returning! Older homes in the Minneapolis area can provide numerous entry points for mice to return. Due to the scent a mouse leaves behind, a trail is left for additional mice to follow. 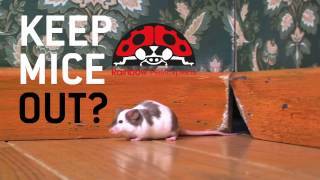 As the leaders in mouse control, Rainbow Pest Experts offers a warrantied, long-term solution for you. Our goal is to provide you with peace of mind that mice are stopped, before entering your home. No one else in the Twin Cities specializes in mouse control like Rainbow Pest Experts. We take the time to do the job thoroughly and professionally. Our complete mouse elimination stages (one and two) takes an average of 4 hours. One of our experts will conduct a thorough inspection to find where the mice are getting in, and how best to eliminate the current population. Our first step is to get rid of the mice already in your home. Reducing the population in your home includes trapping and baiting. We do this in the safest way possible with bait stations. We also choose the most effective and long-lasting products professionally available. While this will provide a short term solution to mice, it does not prevent them from returning. We recommend ongoing maintenance of bait stations as part of a pest prevention plan if you opt out of stage two. Using only commercial-grade products that mice cannot nibble through. We seal every accessible crack the size of a pencil or larger, preventing mice from invading your home. * The commercial grade products we use include flashing, concrete, copper mesh and elastic sealant which moves and shifts with the structure; extremely important in Minnesota. Added bonus, you’ll likely have energy efficiency and a reduction of insects from the seal up work completed. No one wants to share their home with rodents. Let Rainbow Pest Experts control the ones inside and keep the rest out. *NOTE: Limitations that prevent a thorough and successful foundation seal up include: any obstructions such as a deck or a porch built very low to the ground (less than three feet high), existing building materials that mice can easily chew through such as foam insulation, and in less frequently encountered situations, very old homes with flagstone foundations, which are susceptible to crumbling and natural degradation over time. **Warranty available to customers who have completed interior and exterior mouse protection; contingent upon full access to the foundation, attached garage and attic.